Cover of book done by graduate students. Hurricane Katrina had a devastating impact on New Orleans and the Alabama, Mississippi and Louisiana Gulf Coasts, and now a book written by Sam Houston State University students tells its story as never before. The book was written and edited by members of Paul Ruffin's editing and publishing class and published by the Texas Review Press. That Rough Beast, Its Hour Come Round at Last follows Hurricane Katrina from its beginning as a tropical wave in the Atlantic through its eventual dissipation off the coast of eastern Canada. The costliest hurricane ever to strike the United States, and one of the most deadly in terms of human life, on Aug. 29, 2005, Hurricane Katrina completely destroyed stretches of the Mississippi Coast and was indirectly responsible for the devastation of large sections of New Orleans’ Lower Ninth Ward. An extremely wide storm, its landfall effects were felt from Louisiana as far east as Mobile, Alabama; in fact, most of the structures on Dauphin Island, off the Alabama Coast, were totally demolished or badly damaged. Though a number of books have been written about Katrina, That Rough Beast is unique in its presentation of never-before-published pictures of the damage of the storm and through interviews with victims who survived Katrina but lost nearly everything they owned. The photographs and interviews in the book came from materials gathered by Ruffin, who visited the Mississippi Coast and the Lower Ninth Ward not long after the storm and wrote a number of feature articles about his trip, and from work done by SHSU graduate student Michael Dunican, who visited those areas and Dauphin Island in 2006. The students who wrote That Rough Beast—Heather Andrews, Tameika Ashford, Joshua Bowen, Brandon Cooper, Lesley Cort, Michael Dunican, Steven Rydarowski, and Melanie Sweeney—did all the research on the storm, wrote the text, chose the photographs, laid out the interior of the book, and designed the cover. The book begins with the early history of the storm, then focuses on Louisiana, particularly the Lower Ninth Ward of New Orleans, then Mississippi, then Alabama. After covering those areas, with over a hundred photographs graphically illustrating the devastation of Katrina, the book follows the storm’s wrathful swath across the United States and into Canada, where flooding and tornados caused damage in a number of states and two Canadian provinces. The book concludes with the story of the plight of the animal victims of the storm, with a number of heartrending photographs. 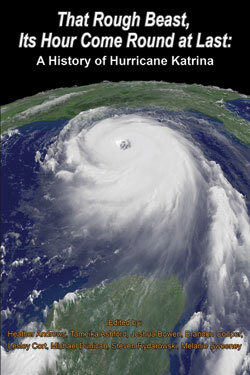 An appendix and glossary are provided at the end to familiarize the reader with terms associated with hurricanes. Ruffin said that SHSU student involvement with Katrina is not over. This fall's English 533 class will produce a book on the impact of Katrina on churches along the Mississippi Coast, complete with before-and-after photographs, the history of the restoration of the churches, and interviews with ministers and members of the congregations. Copies of That Rough Beast, Its Hour Come Round at Last may be purchased from the Texas Review Office, 152 Evans Building on campus, by phoning 936.294.1992, or through the Texas A&M Consortium, phone 800.826.8911. It is also available on line at amazon.com.